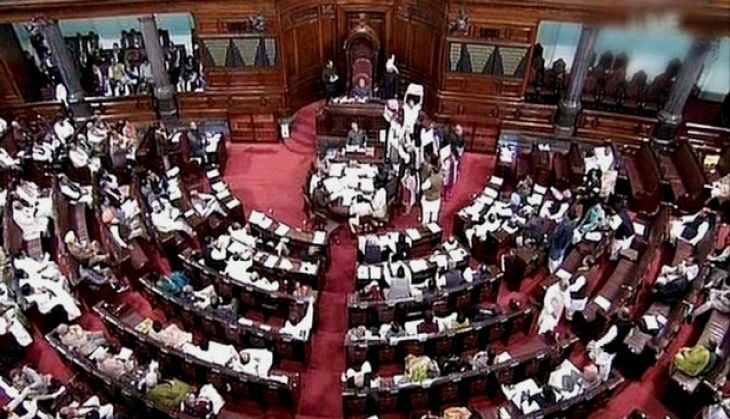 The second day of the Rajya Sabha turned out to be a stormy affair after the Centre and the main Opposition party locked horns over the Uttarakhand crisis and the JNU row causing the session to be adjourned thrice during the day. 1. Nominated members Swapan Dasgupta, Narendra Jadhav, Mary Kom, and Subramanian Swamy took their oath. 2. The session was adjourned till 12 noon after the agitated Opposition party raised slogans against Prime Minister Narendra Modi. Slogans like, "Modi teri tanashahi, nahi chalegi, nahi chalegi," were hurled at the BJP. 3. Speaking about Uttarakhand's political crisis, Finance Minister Arun Jaintley said the real breakdown of Constitutional machinery in Uttarakhand was due to the decisions of the Presiding Officers to "convert majority into minority and minority into majority". He also said that it was the first time in 70 years that a defeated Appropriation Bill was considered passed. 4. Countering BJP's stand over the Uttarakhand crisis, the leader of the Opposition in the Upper House, Ghulam Nabi Azad stated, "When the Uttarakhand Governor directed chief minister Harish Rawat to prove his majority on the floor of the Assembly on March 28, why did not the BJP government wait till then." 5. BSF Chief Mayawati also demanded a discussion over Article 356 saying it is being widely misused by the government. 6. CPI members went on to raise the issue of JNU students Umar Khalid and Anirban Bhattacharya facing rustication and imposition of fine. The members termed it as an "authoritarian policy" that was would spoil the academic career of the students. 7. Prof. PJ Kurien adjourned the House till noon as noisy scenes prevailed. However, there was no change in the situation when it re-assembled at 12.35 pm, following which Chairman Mohammed Hamid Ansari adjourned the House till 2 PM. However, the House was adjourned till 11 am on 27 April after commotion prevailed when the House resumed at 2 pm. 8. The house was finally adjourned for the day at 3 pm after the sloganeering did not stop.